Students will learn the proper use and maintenance of commercial kitchen equipment that are used in most restaurants. Safety, sanitation, equipment operation, and employability skills is a daily focus. Students with a strong work ethic, problem solving skills and good time management should be able to excel in this program. This program runs a restaurant which is open several days per week catering to staff and students. 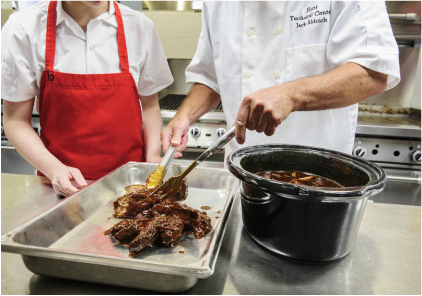 The expectations are that students will learn how to create, bake, or cook a variety of foods by themselves to a level suitable to sell it to customers. A uniform is required and must be purchased. The student must pass a Serv-Safe® certification test during the first quarter in order to work in the kitchen. Prepare and serve food in a working kitchen/restaurant. Use cutting edge kitchen equipment. Cook, bake and try a variety of foods. Students will continue to use the kitchen equipment to improve their skills. Safety, sanitation, equipment operation, and employ-ability skills are a daily focus. Students will be expected to prep, cook and bake food to be served in the restaurant by the end of class time. 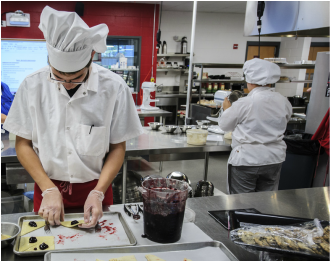 Teamwork and individual skills are stressed to prepare students for immediate employment or to seek advanced education at a Culinary Arts School. The units of study for Culinary II are as follows: Safety & Sanitation, Measurements, Basic Baking, Yeast Dough, Breads, Appetizers, Stocks, Sauces, Soups, Meat, Poultry, Menu Planning. You will be cooking, baking and serving for important community events. Your kitchen job changes every day. Make and bake items that you don’t normally do at home.